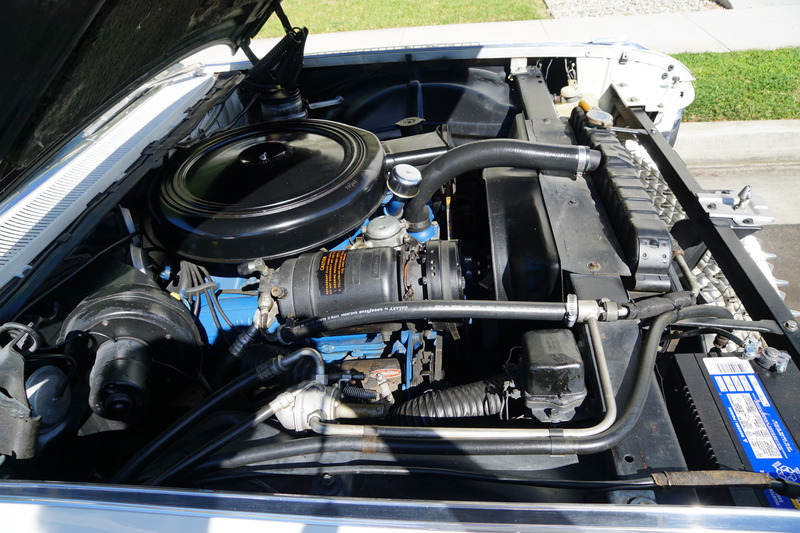 and it's original 390 c.i. 325 HP V8 engine! 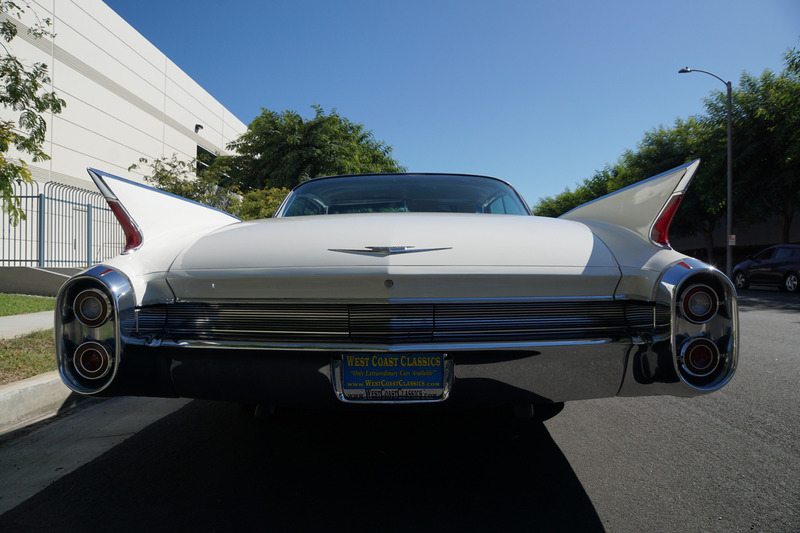 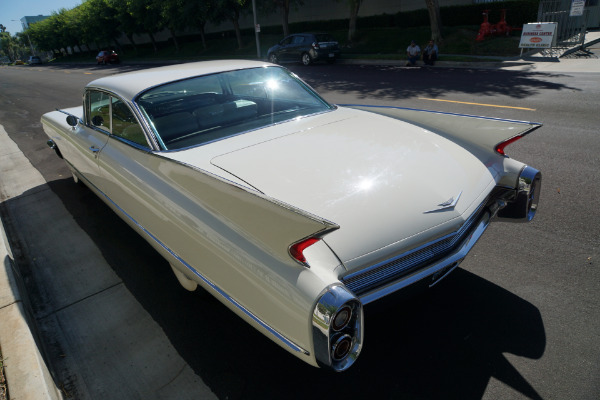 The Harley Earl designed Cadillac Series 62 was a large luxurious Cadillac that could easily carry six people and featured a large 6,390 cc (390 c.i.) 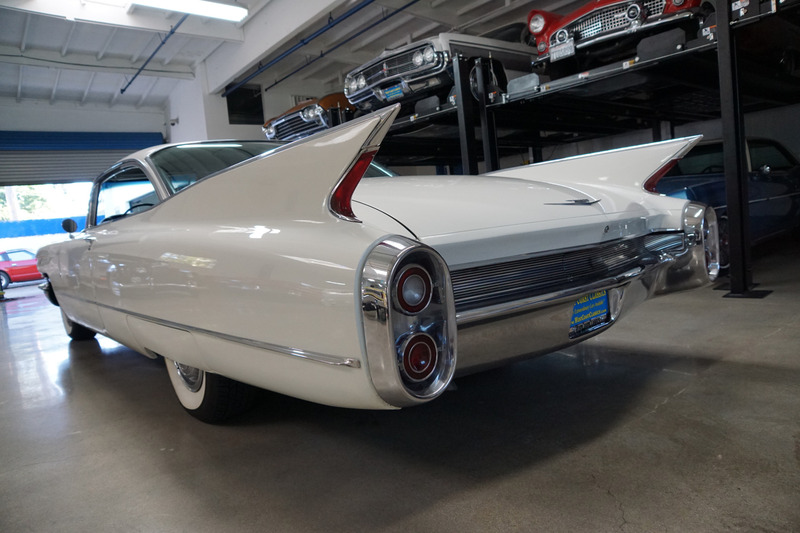 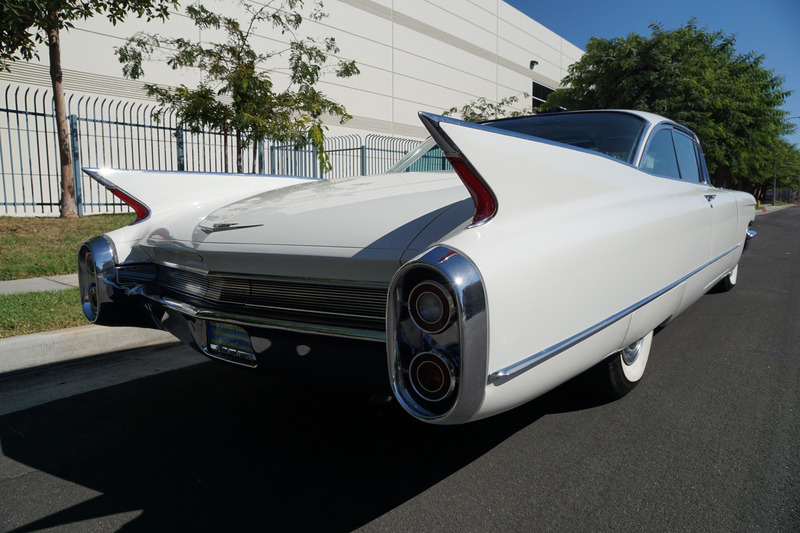 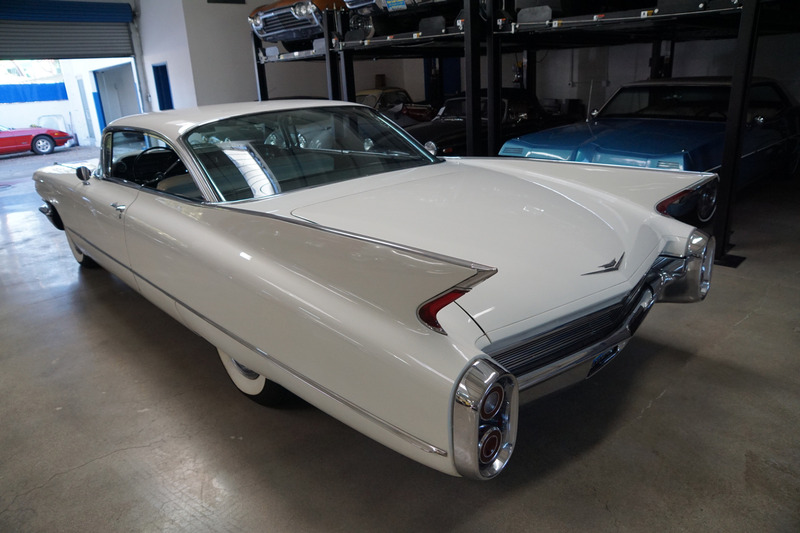 V8 engine with drum brakes and it was the first year Cadillac reduced the legendary rear fins of the fifties, after the 1959 infamous tail fins, Cadillac decided it needed a slightly less dramatic fin with only one single tail light built into it instead of two. 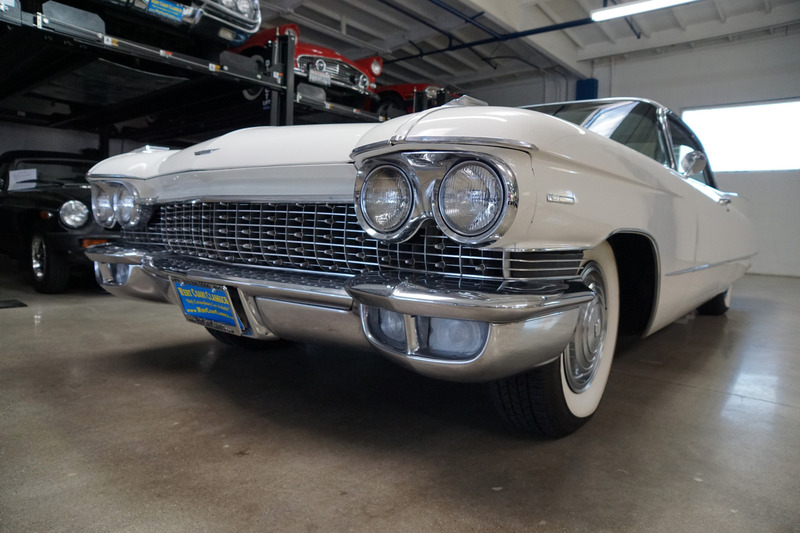 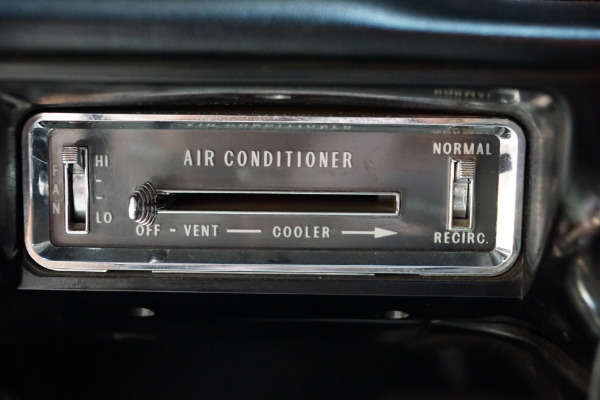 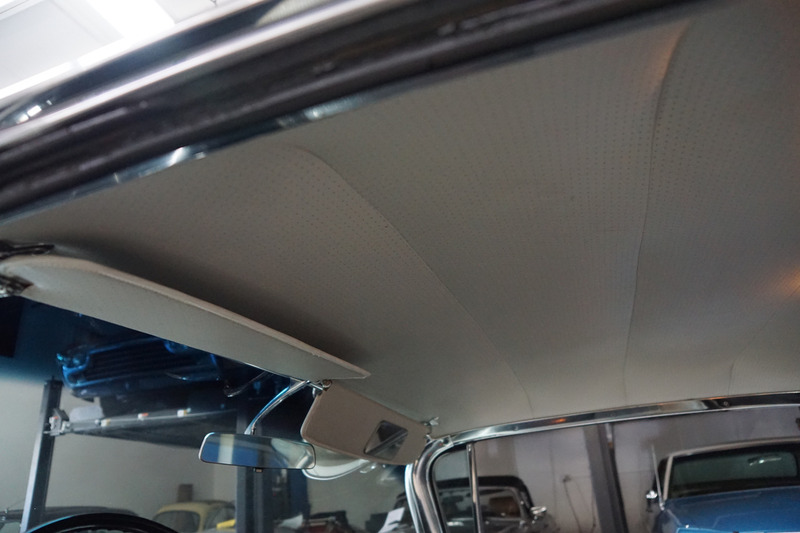 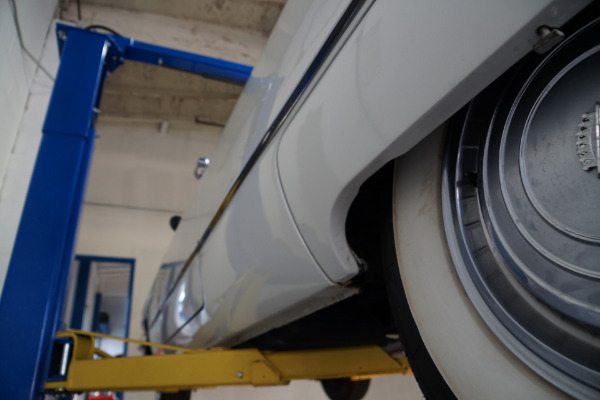 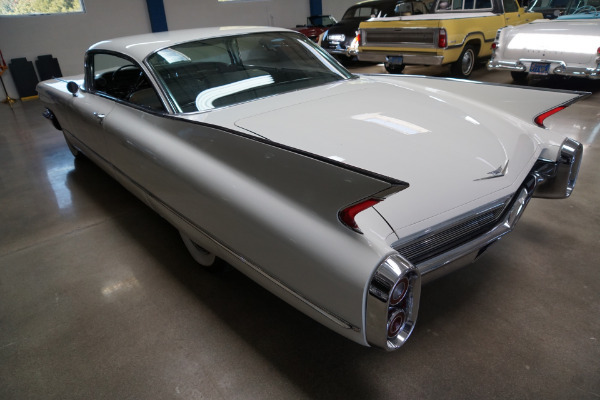 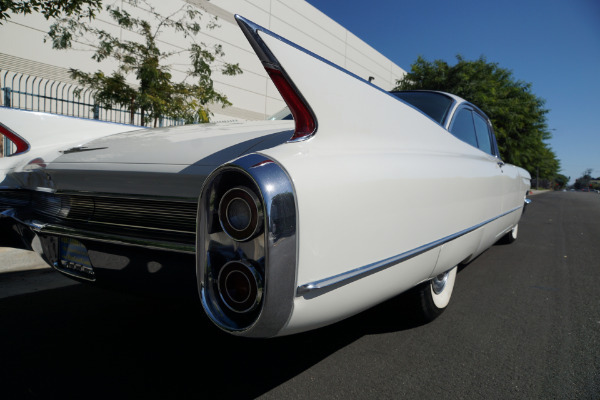 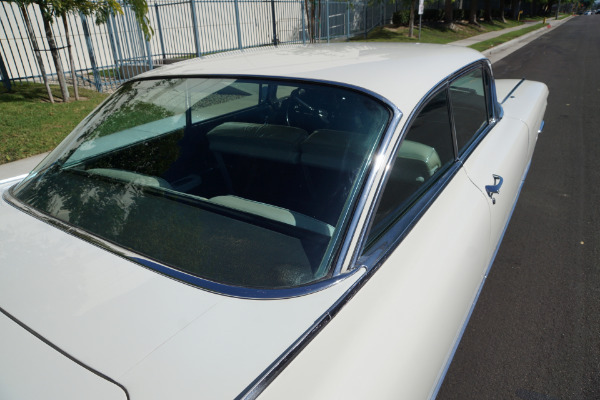 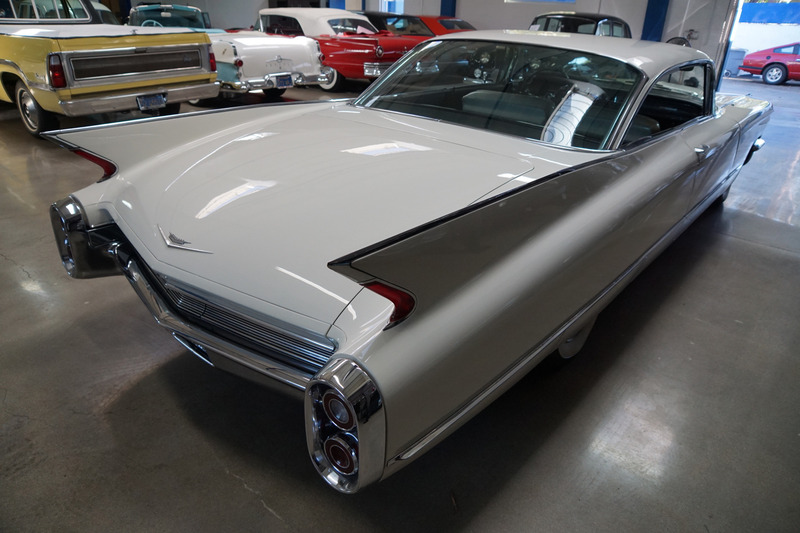 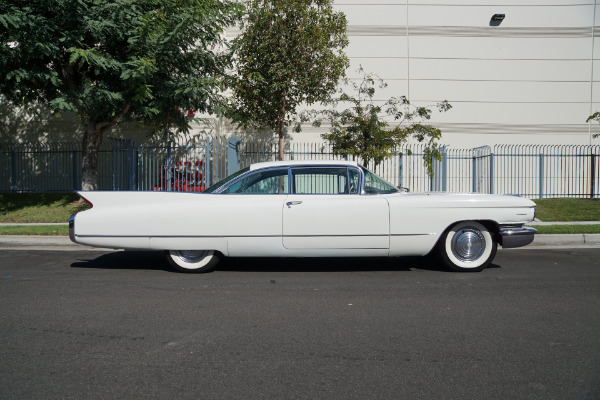 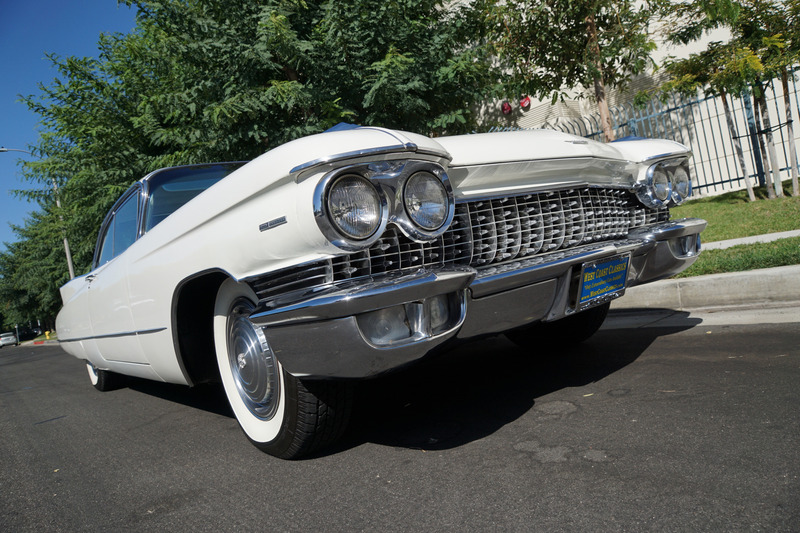 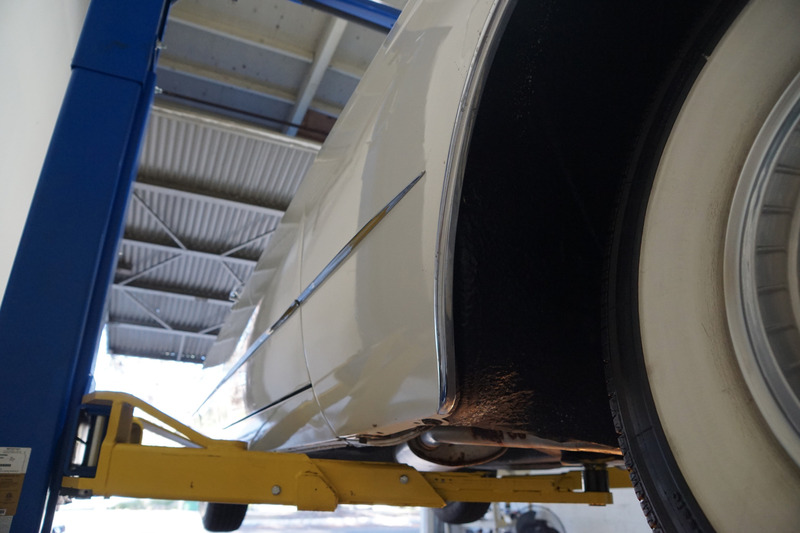 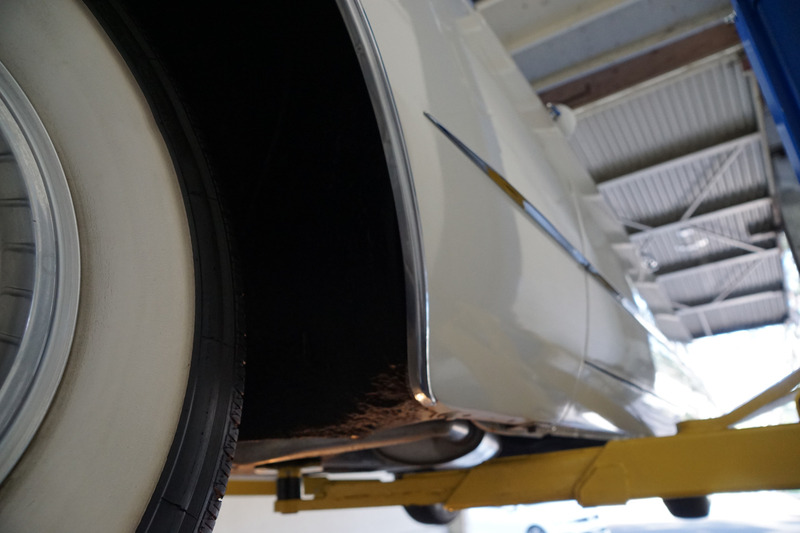 Although the new Cadillacs exhibited a smoother and more subtle rendition of the styling theme with less chrome also, these first year models were still the biggest fins and most dramatic and striking Cadillac's of the sixties. 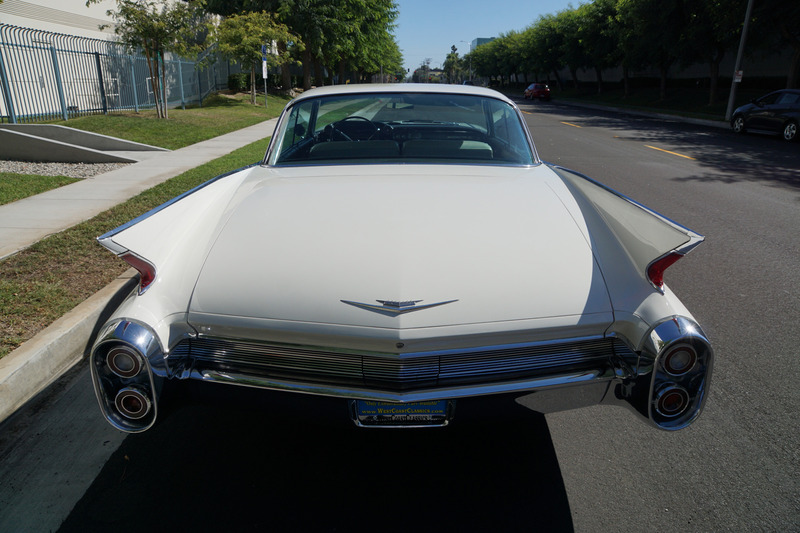 The marque was discontinued in 1964. 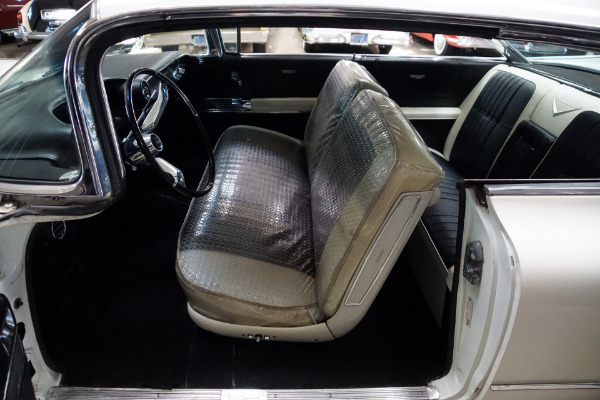 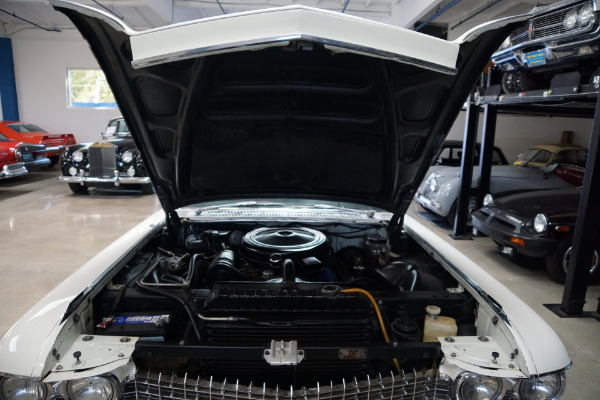 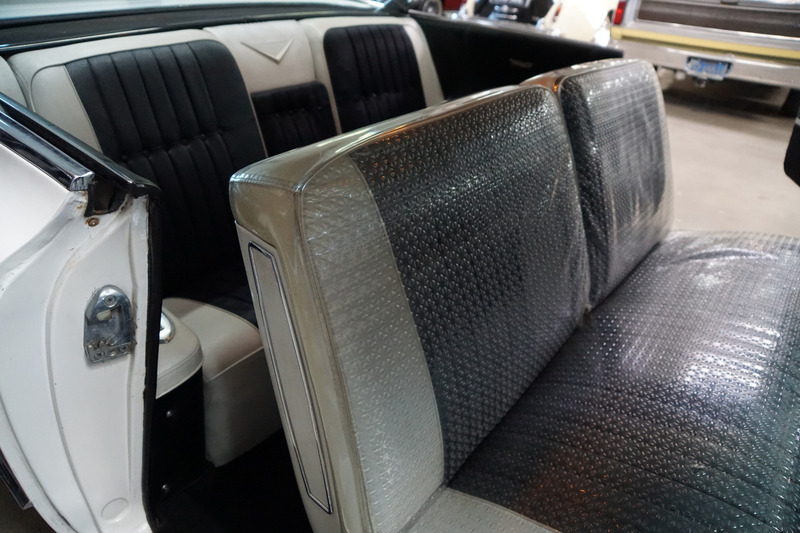 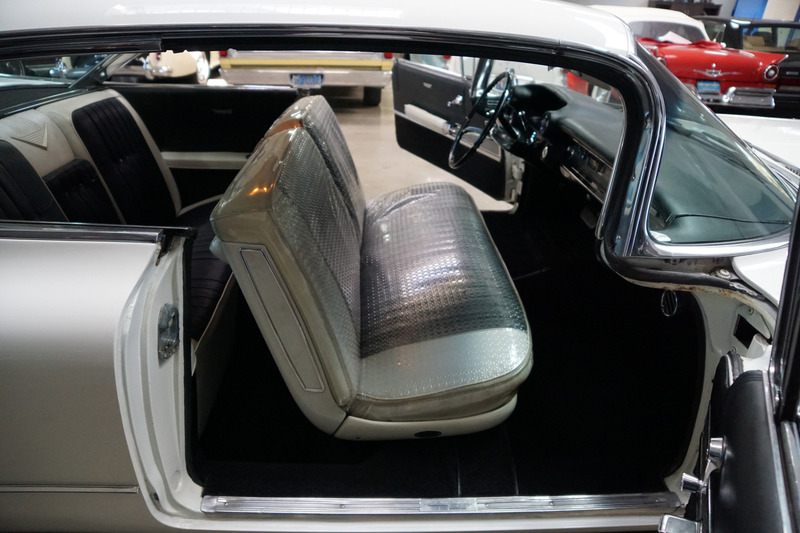 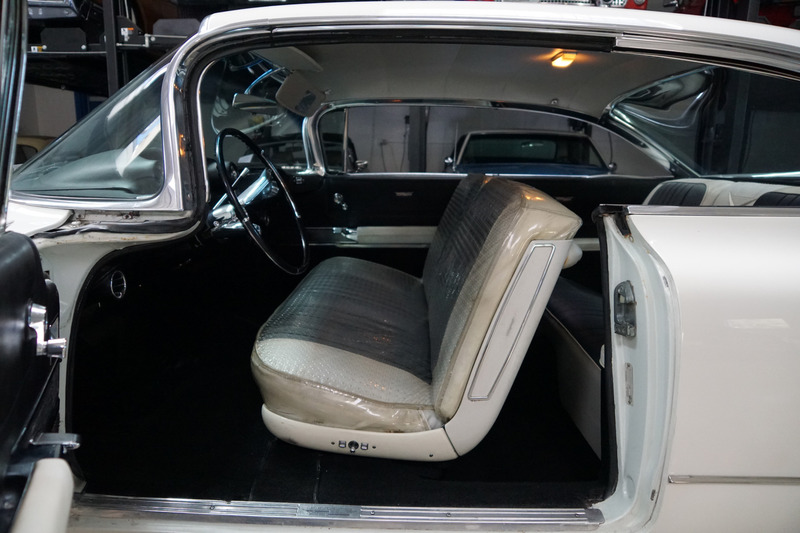 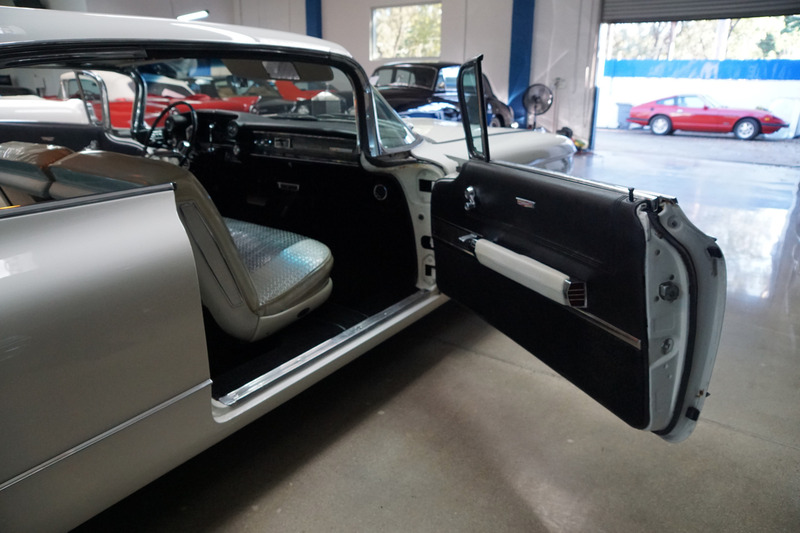 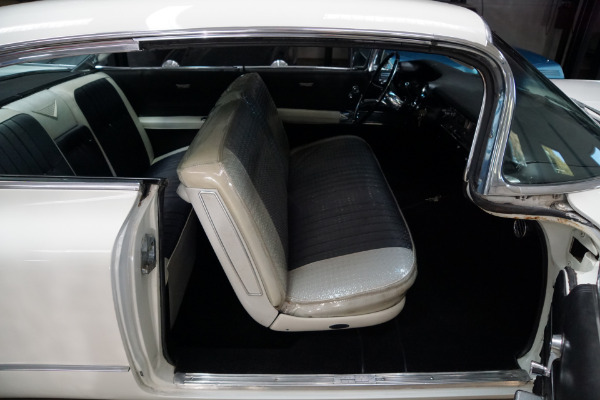 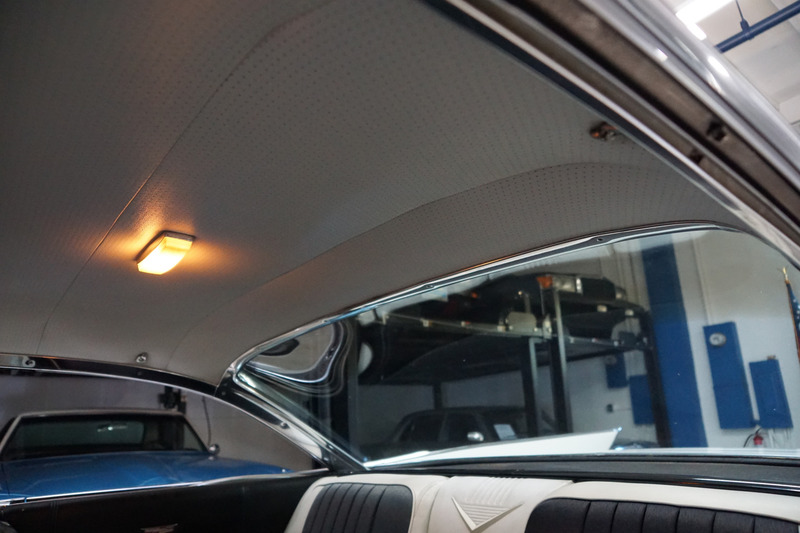 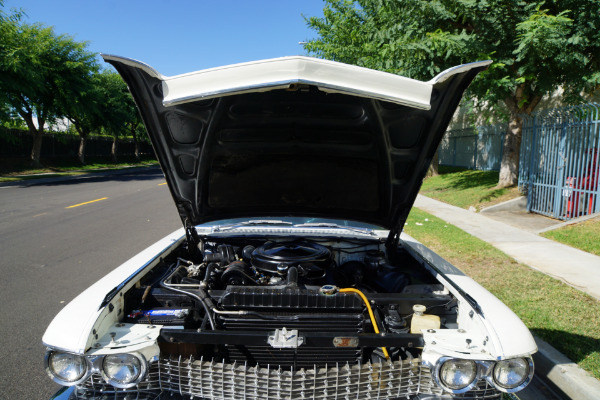 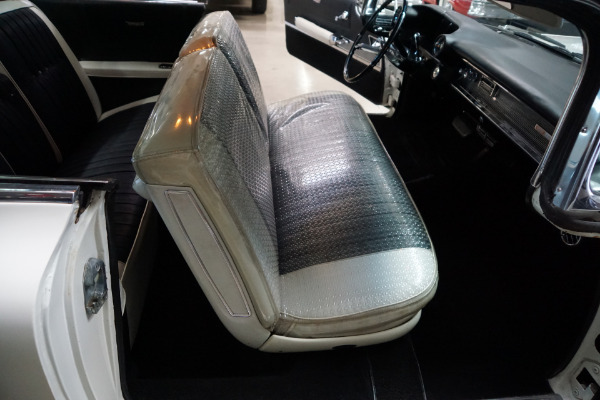 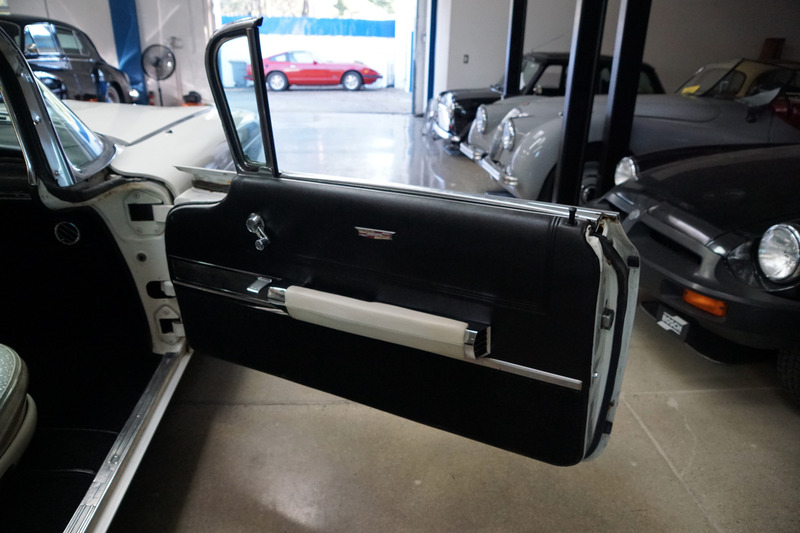 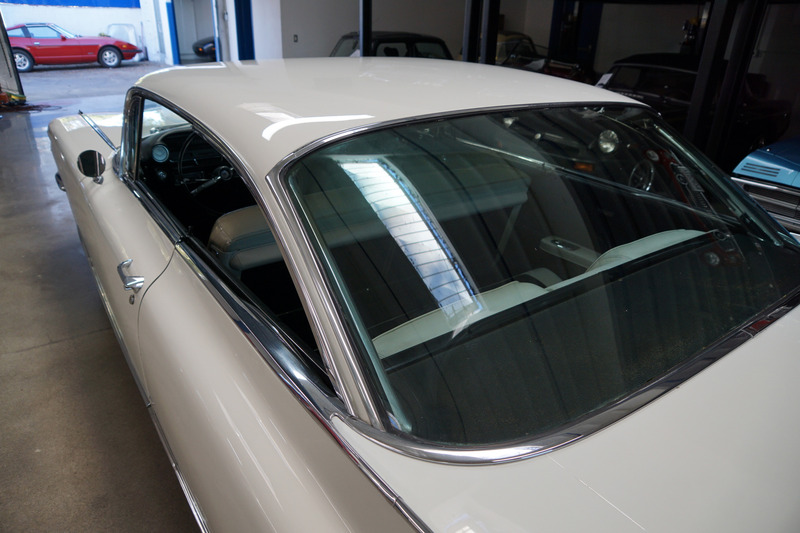 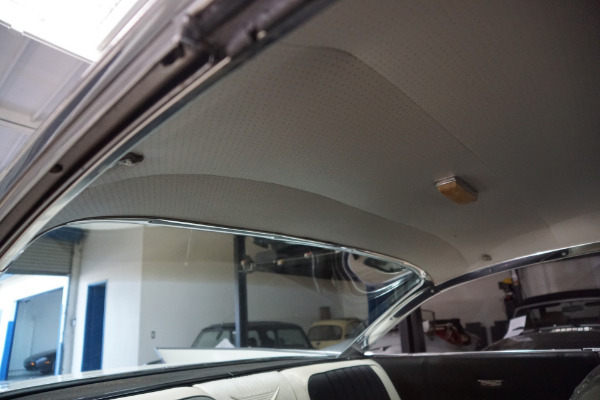 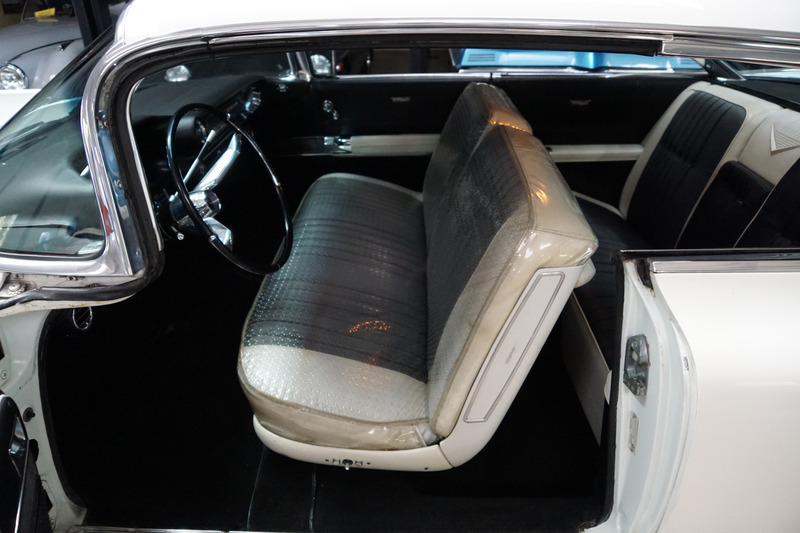 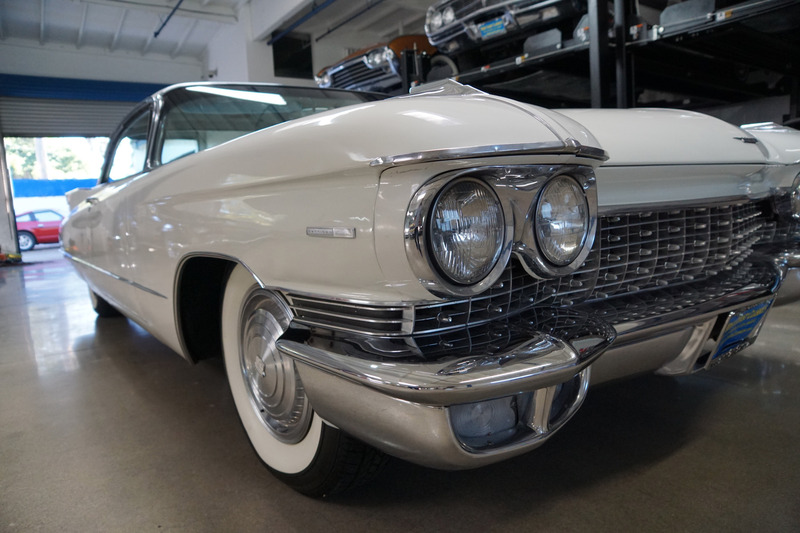 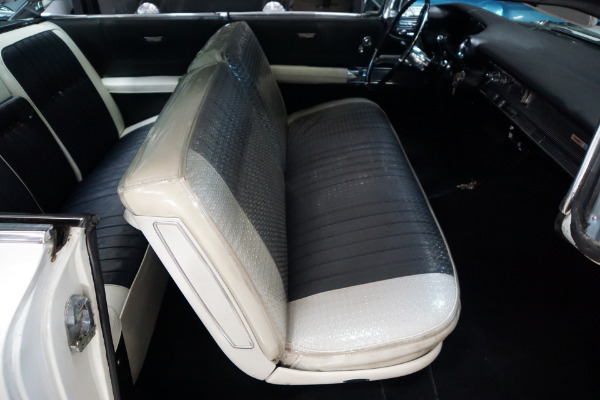 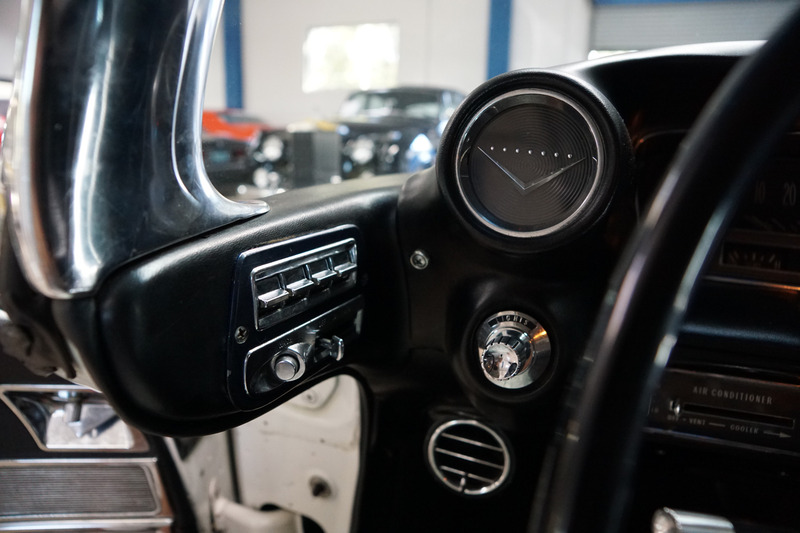 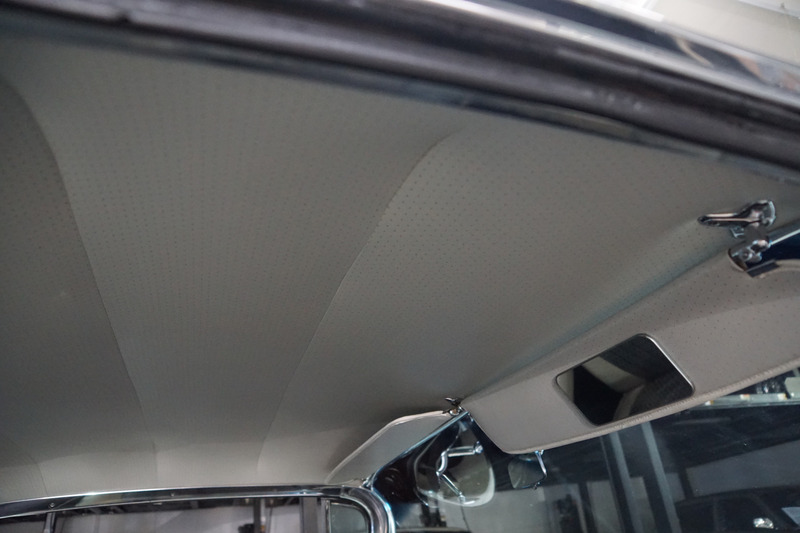 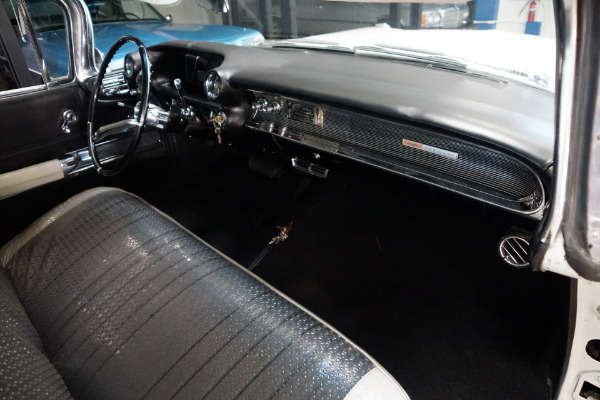 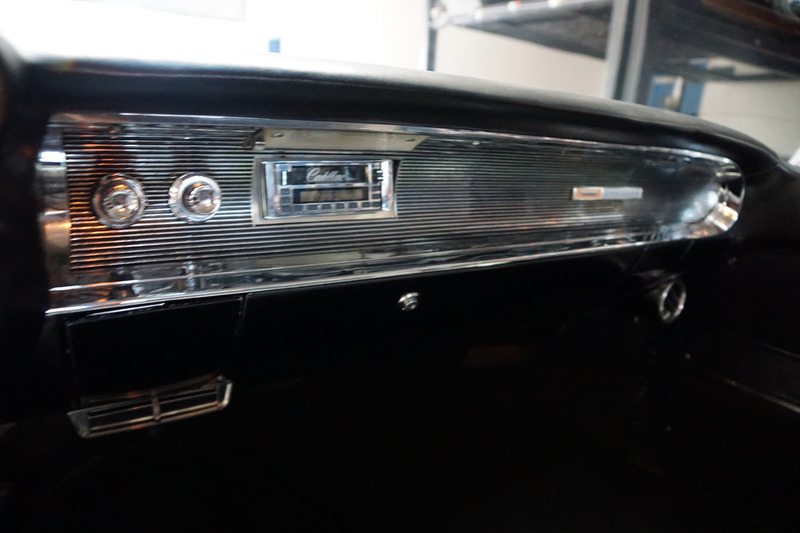 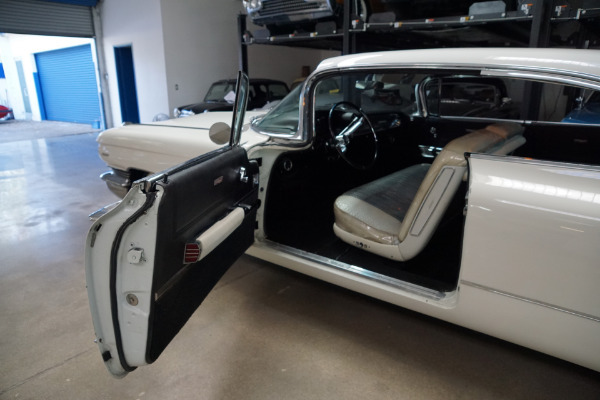 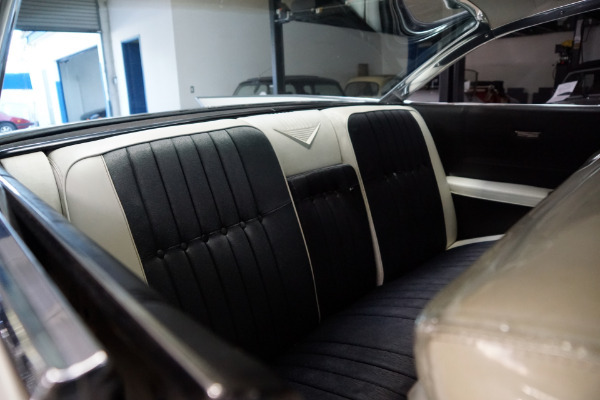 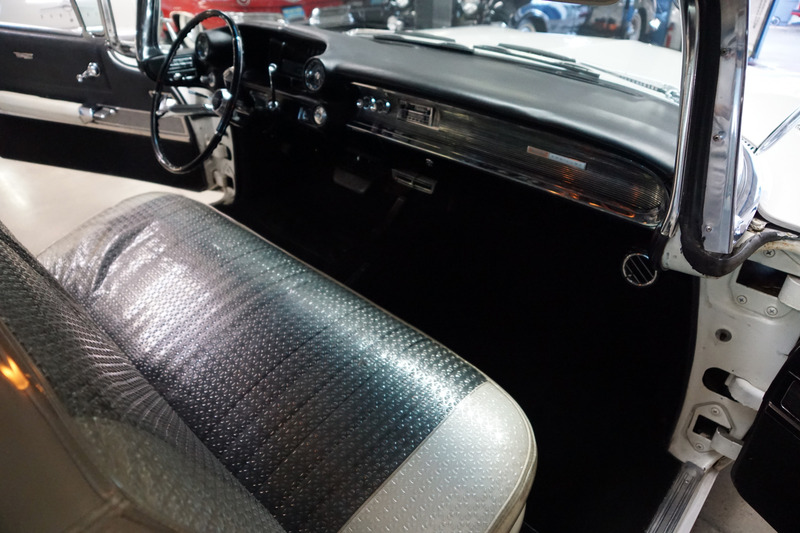 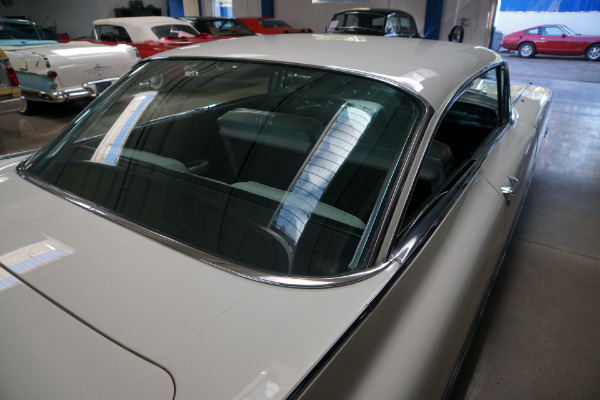 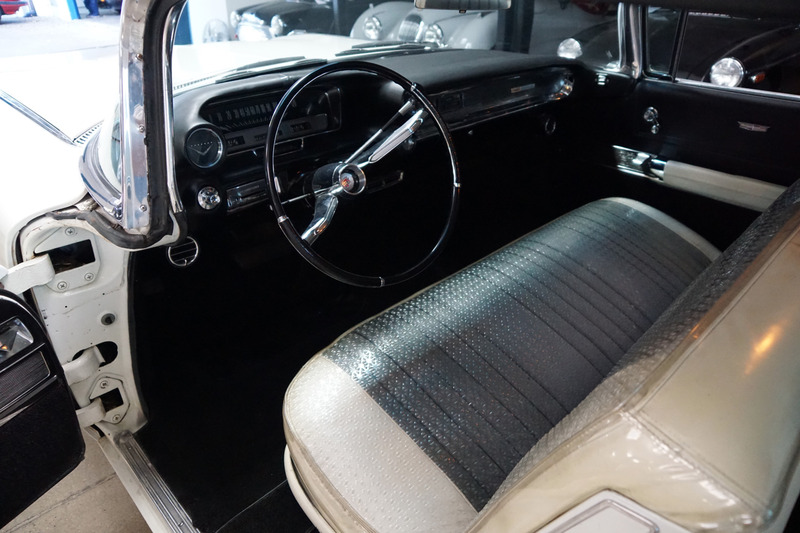 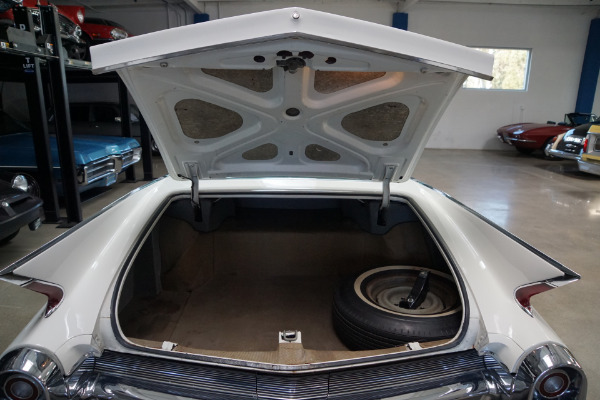 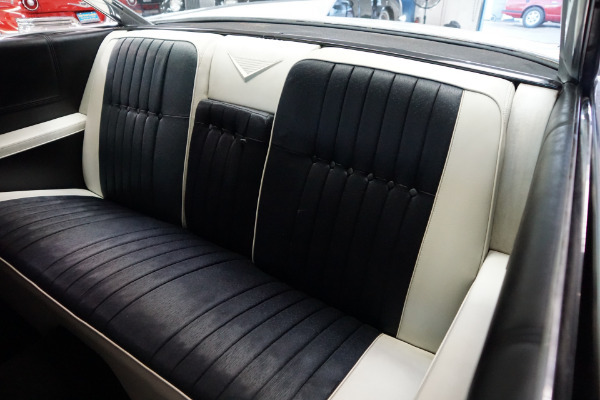 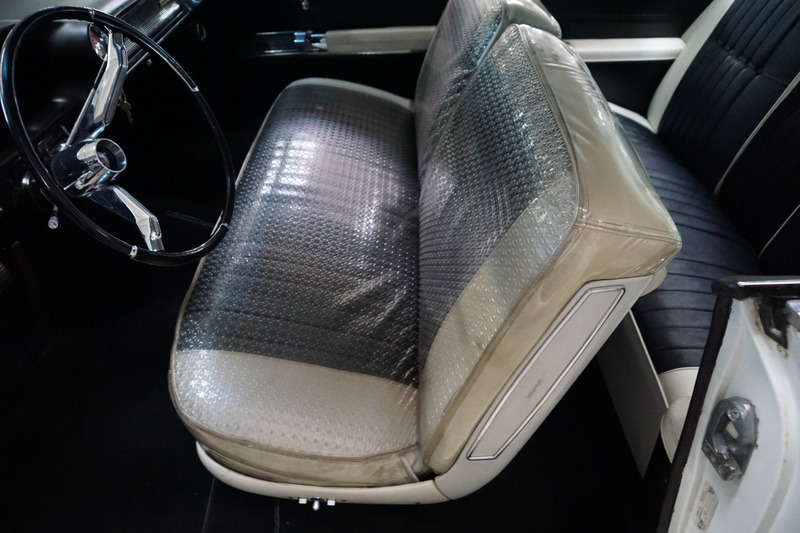 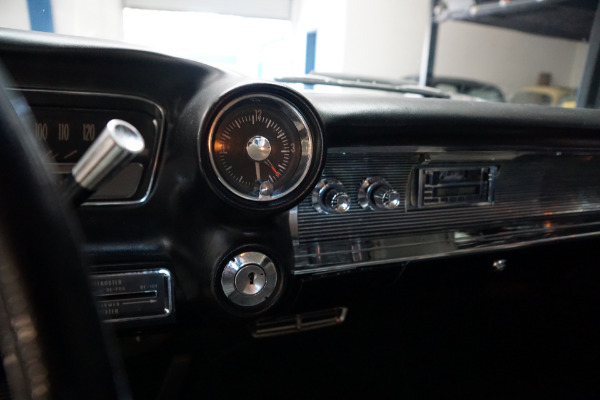 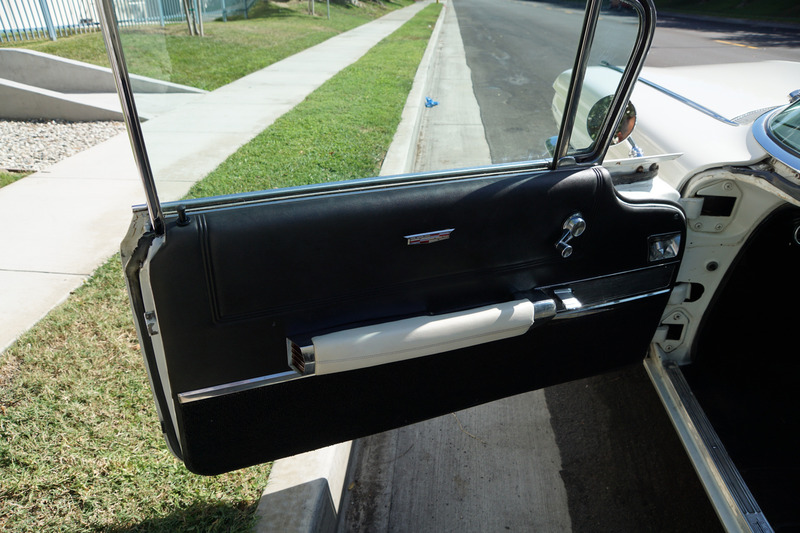 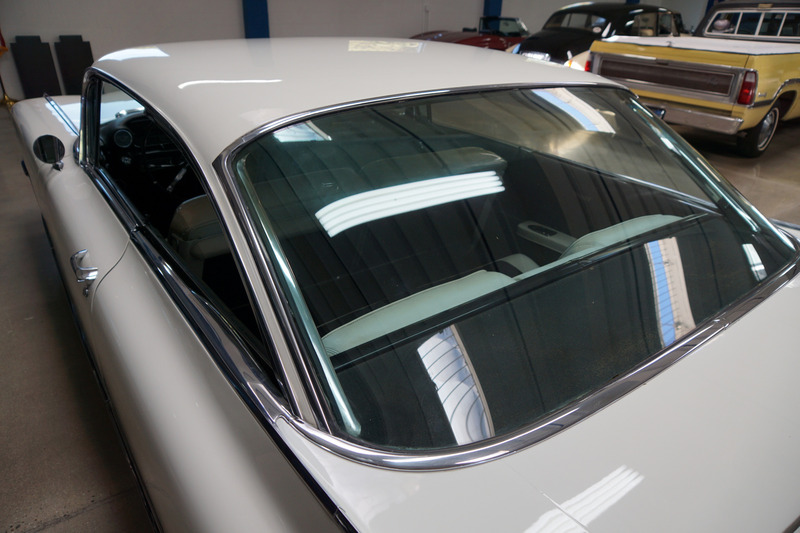 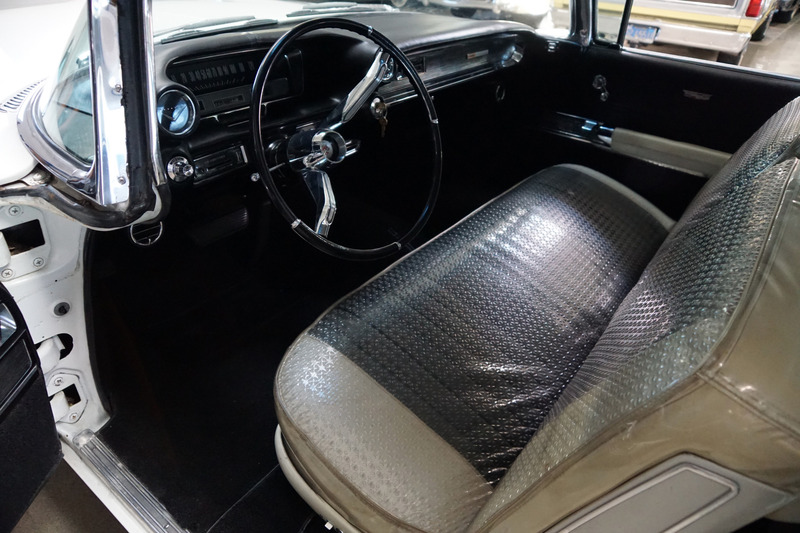 This car has it's original factory 'Olympic White' (color code 12) color paint with a gorgeous and all original with the front seats protected in plastic matching 'Black Caspian Cloth & White Coated Fabric' (Trim code 30) interior! 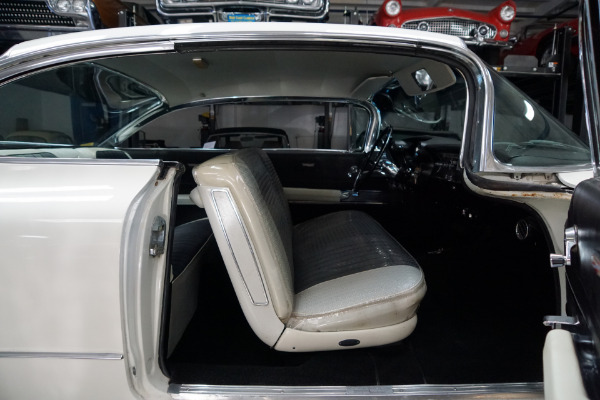 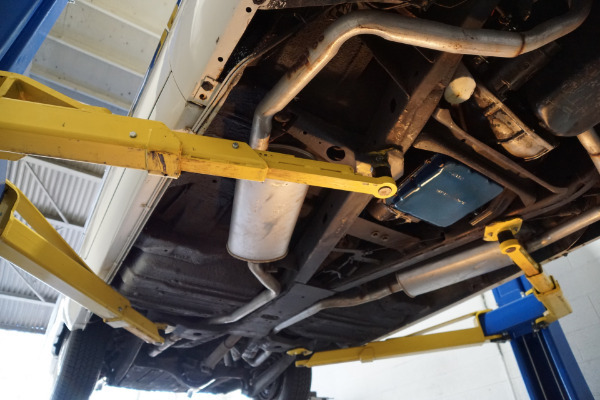 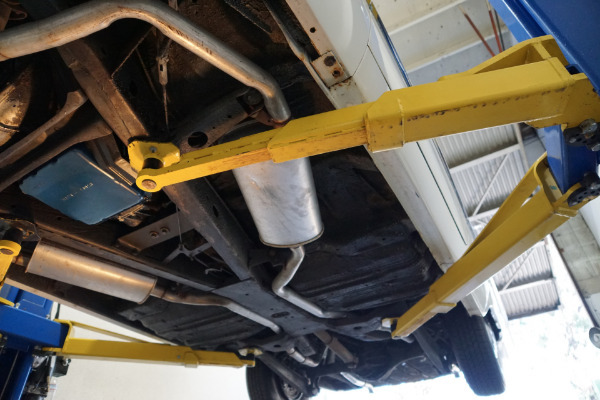 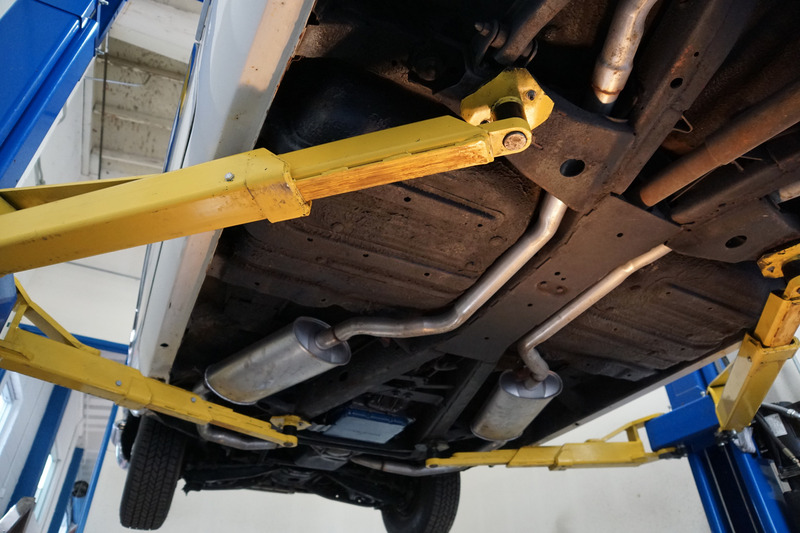 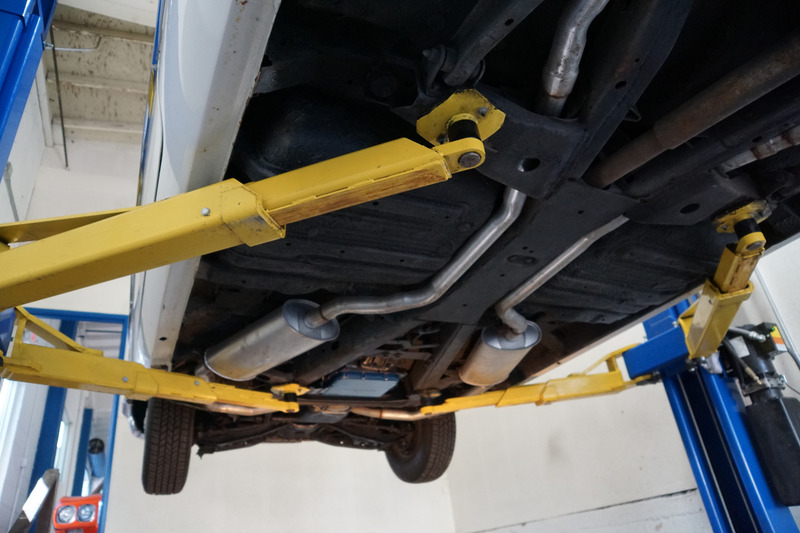 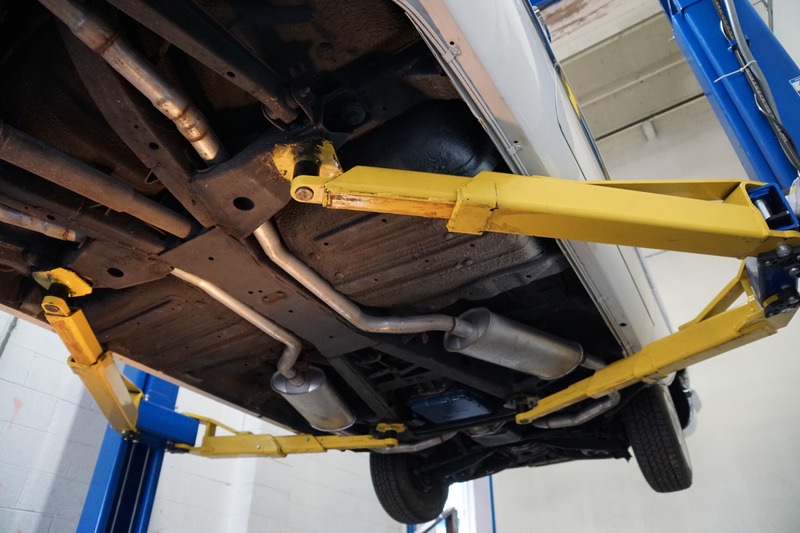 The floor boards, trunk and all the typical rust-prone areas are completely solid and rust-free and the car has no signs of any accidents - obviously an always garaged and cherished car since new and a true survivor which was a California car for many years. 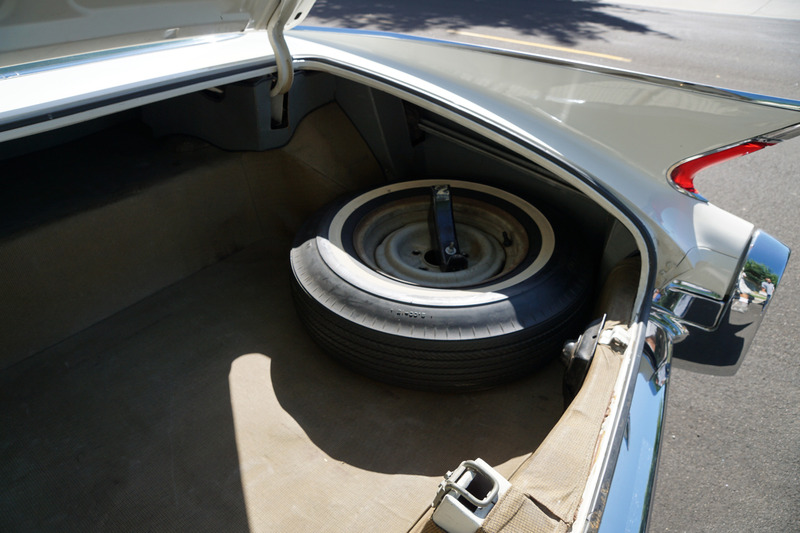 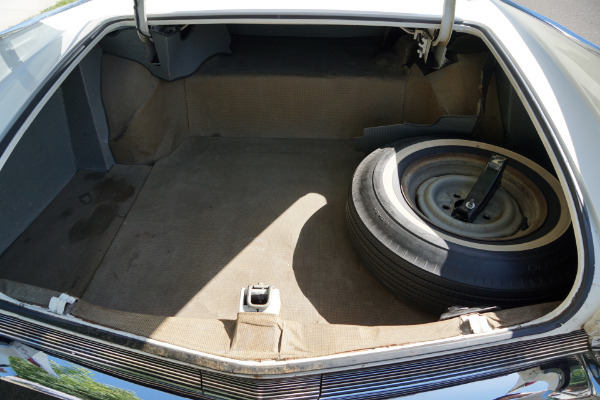 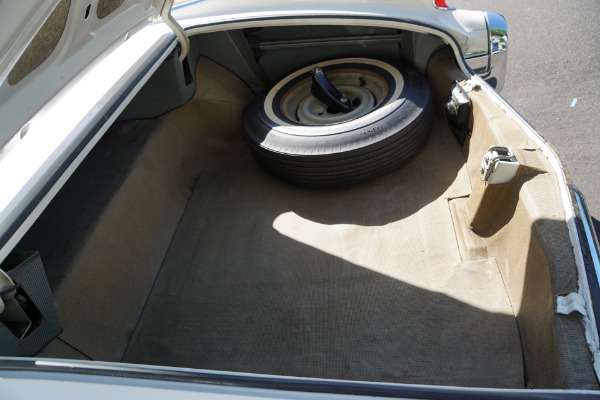 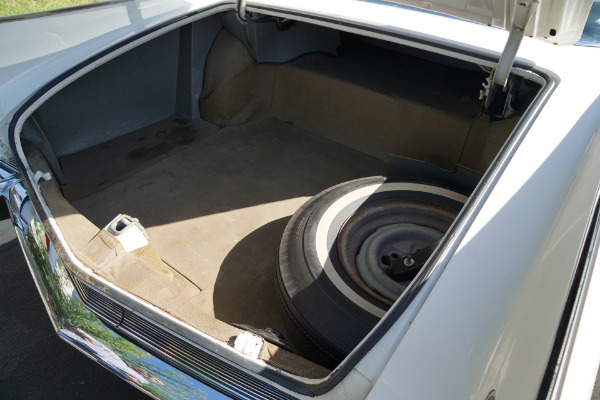 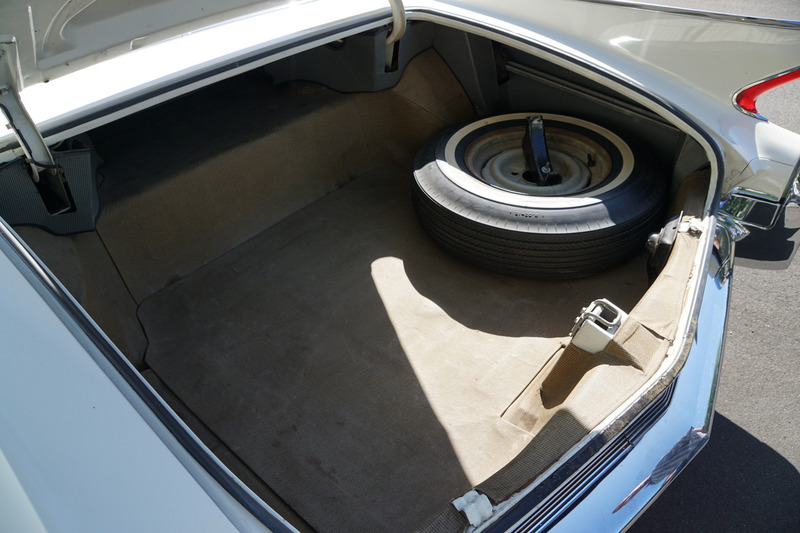 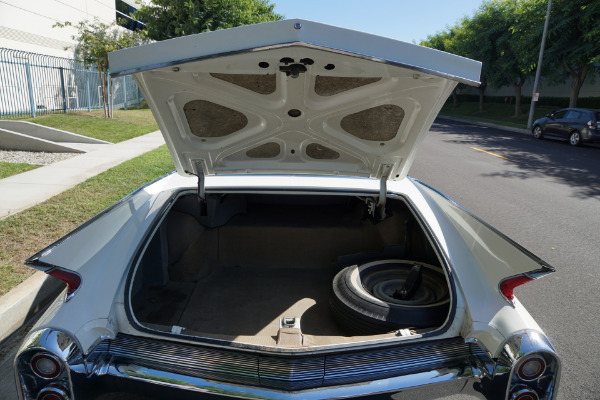 The car even boasts its original spare wheel and 'Goodyear' tire still in their place in the trunk! 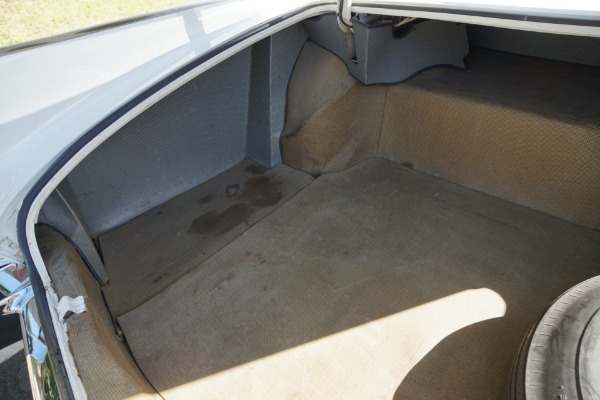 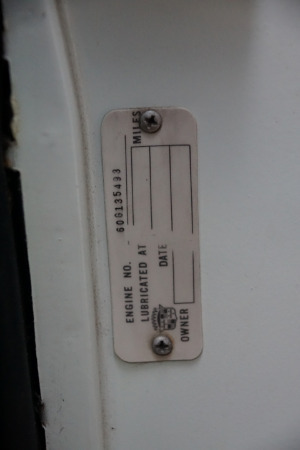 The car has it's original 390c.i. 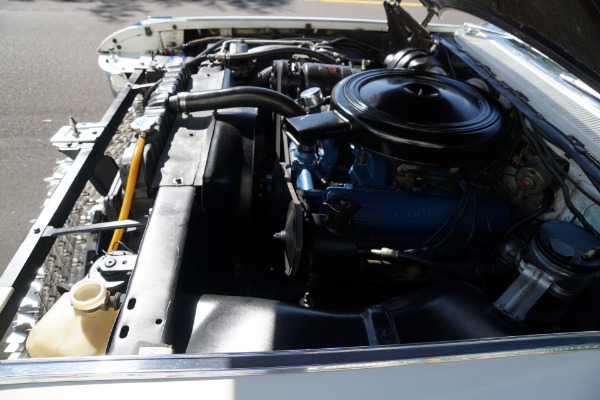 325HP V8 engine which is extremely strong and powerful and sounds absolutely magnificent! This particular car also drives absolutely magnificently - it must really be seen and driven to be believed and appreciated - does not miss a beat and purrs like a kitten - drives straight as an arrow with no strange road wobbles, shakes or rattles - a truly remarkable daily driver that will give any modern day car a run for it's money! 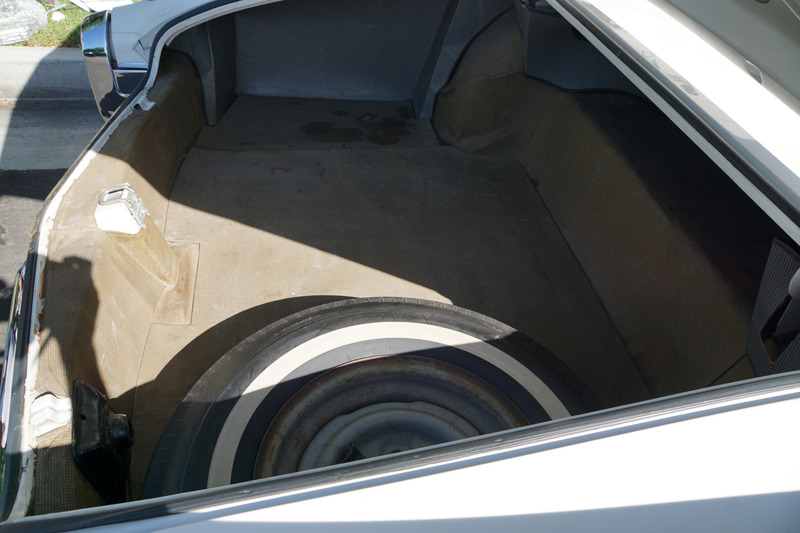 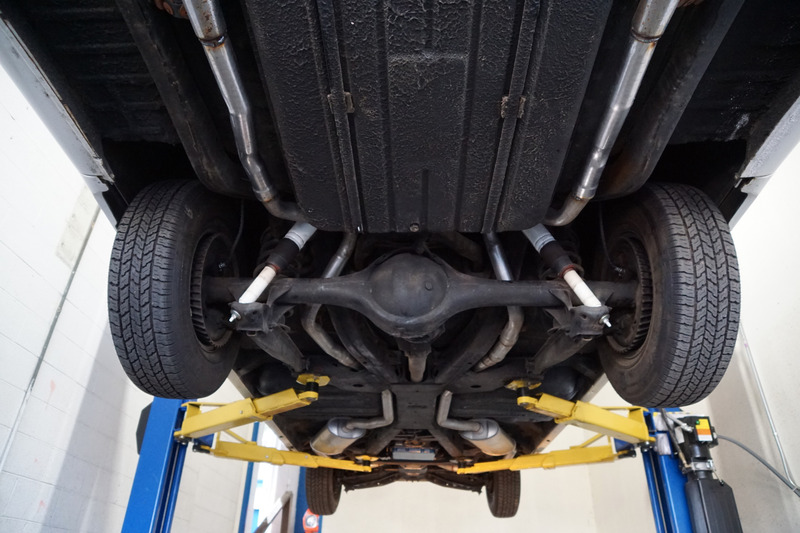 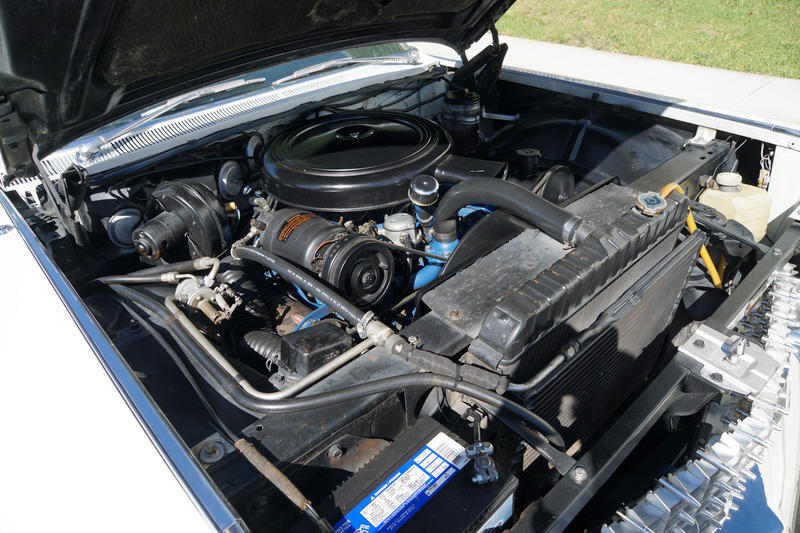 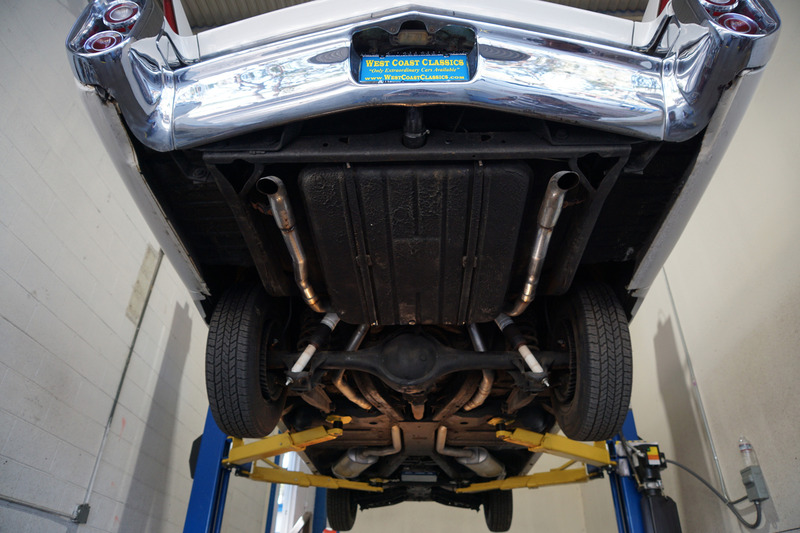 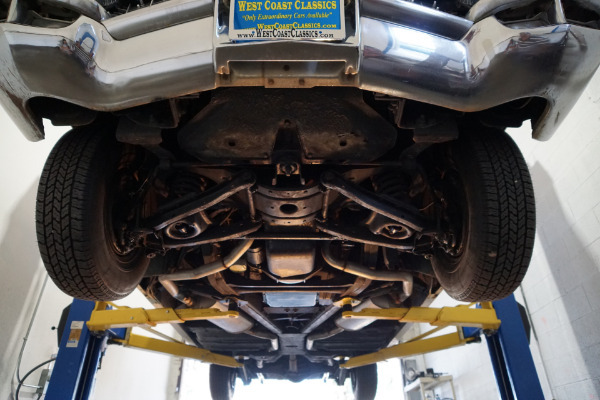 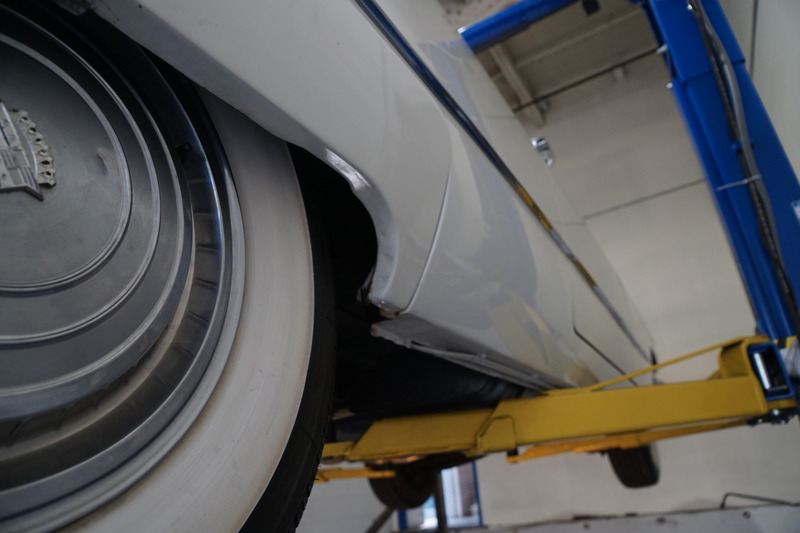 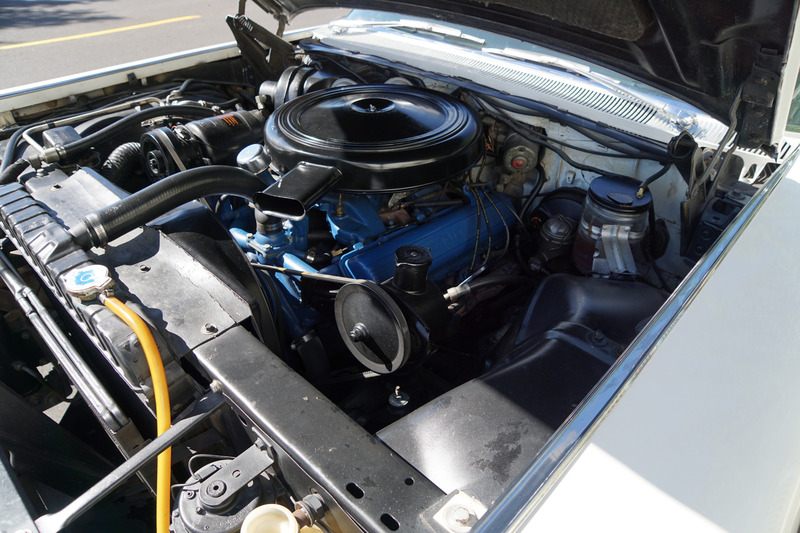 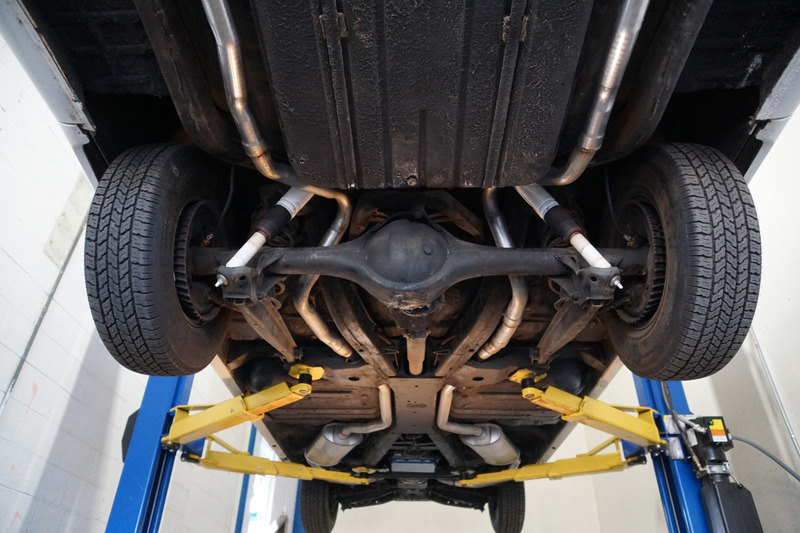 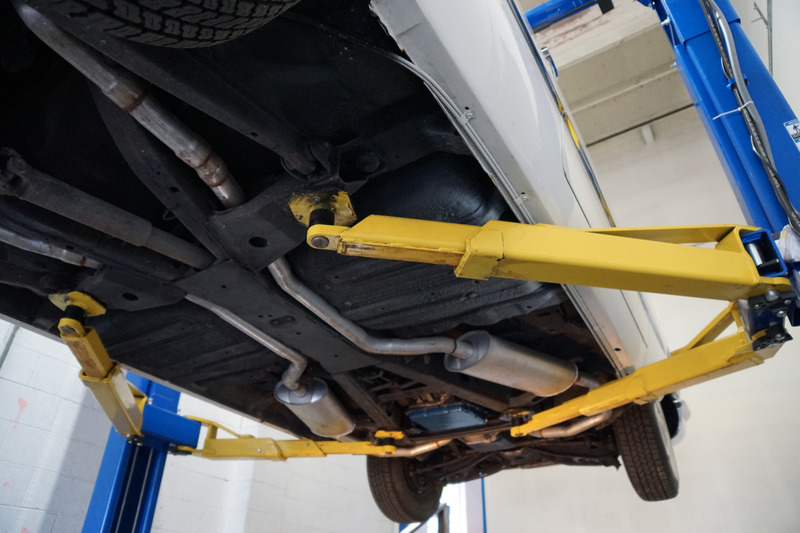 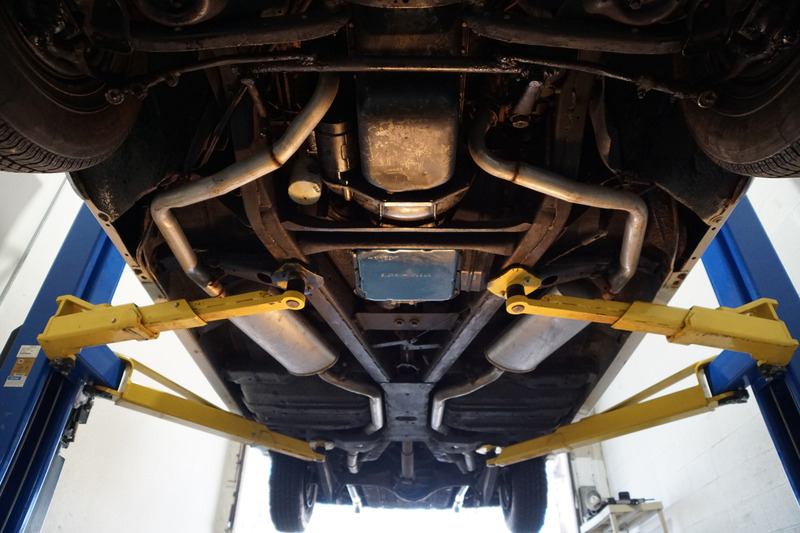 The transmission shifts smoothly through all the gears and the car has four virtually new radial wide white wall tires. 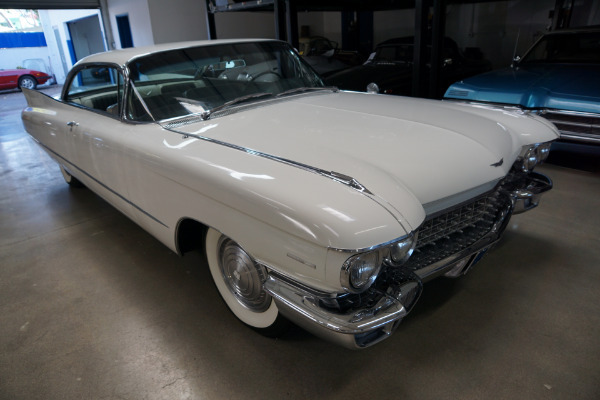 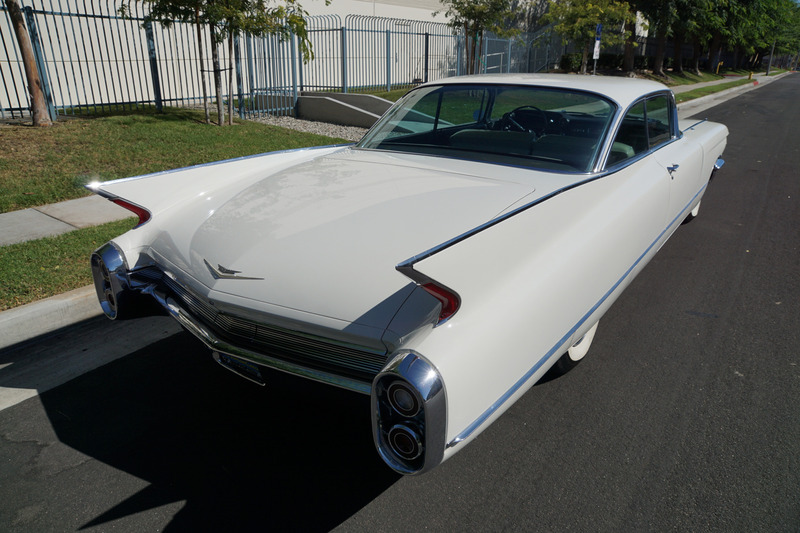 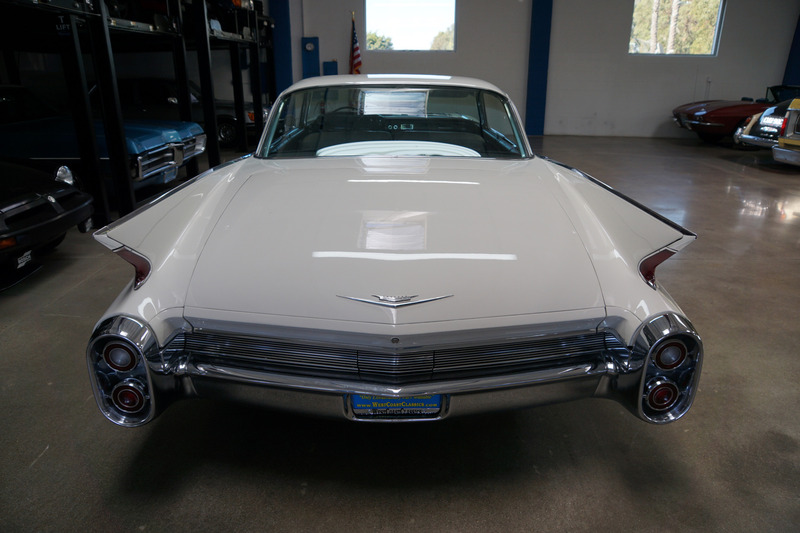 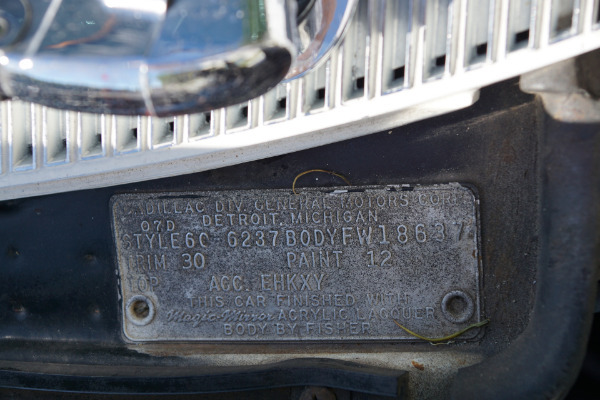 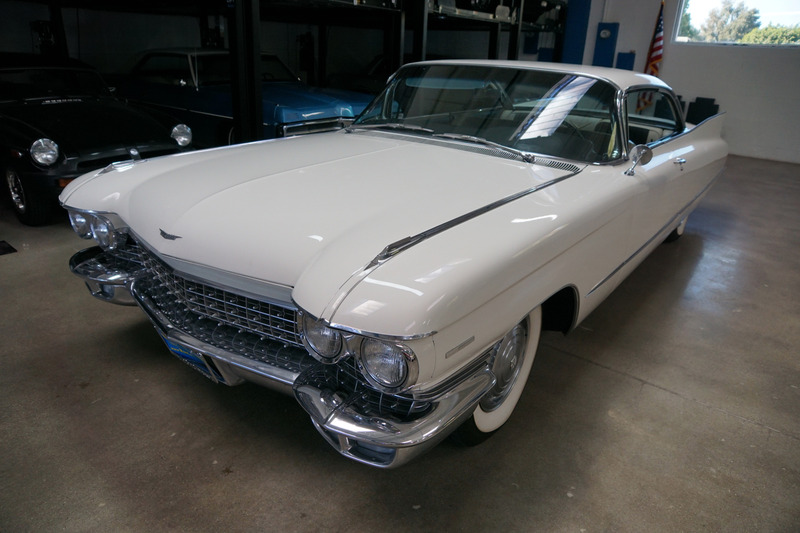 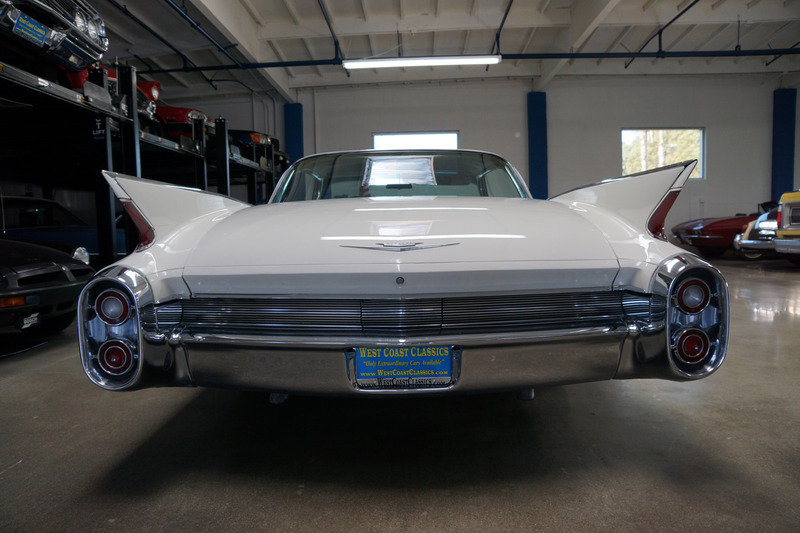 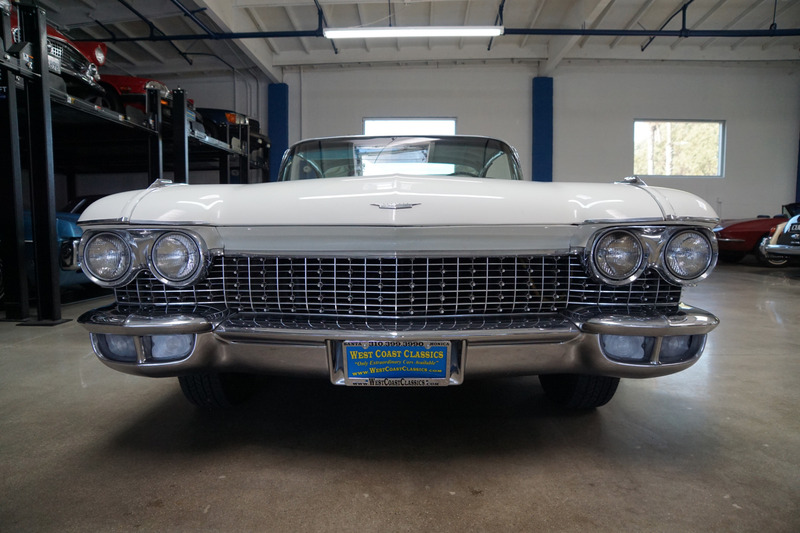 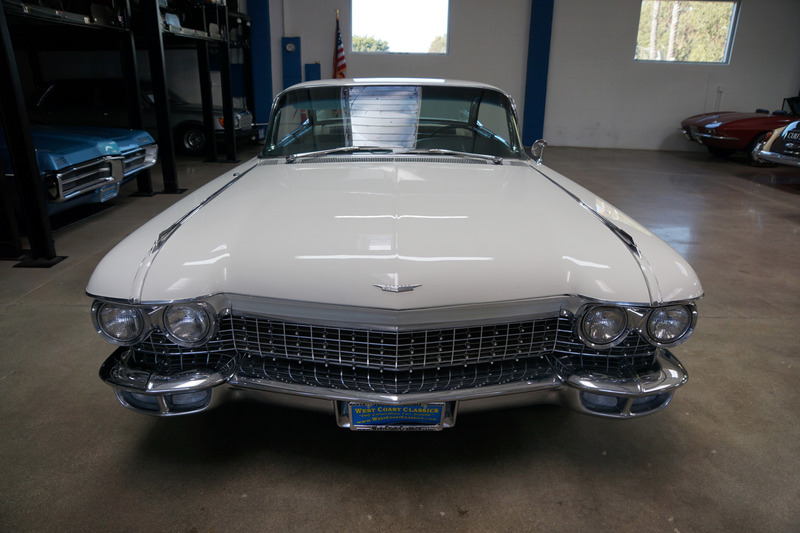 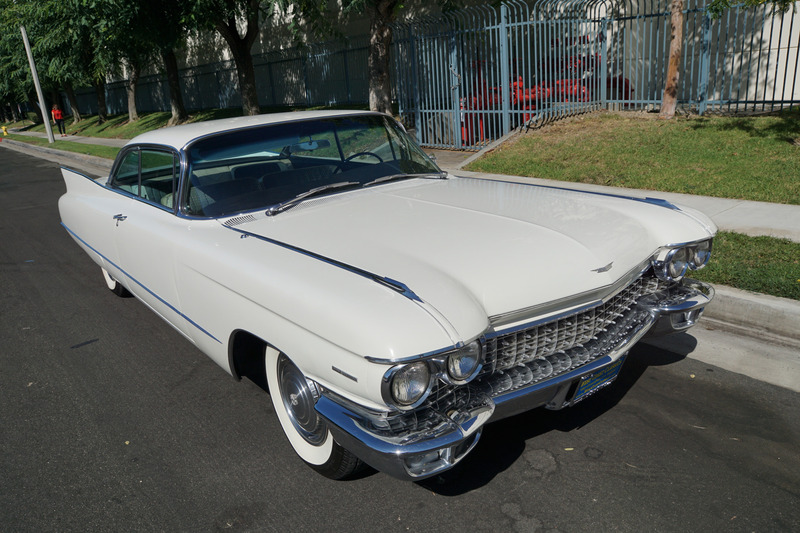 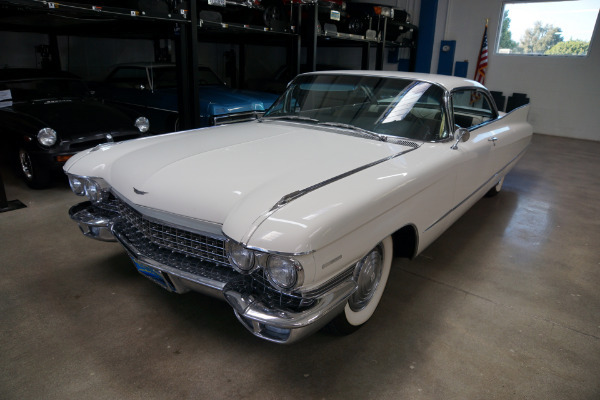 This is a rare opportunity to own a great daily driving and rust free example of a beautifully kept mostly all original surviving specification example of a 1960 Cadillac Series 62 2 Door Hardtop and a super striking example in its rare original Cadillac color and interior and fully loaded with all the desried options including factory air conditioning, power brakes, steering, windows and seats! 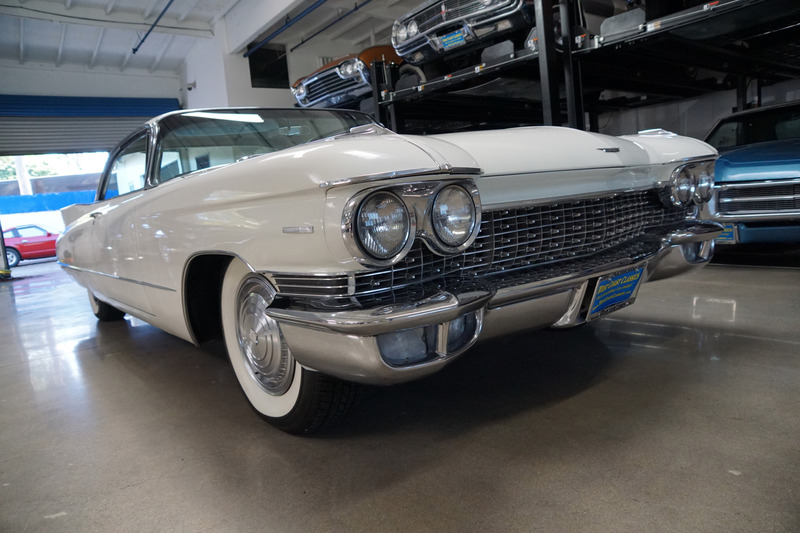 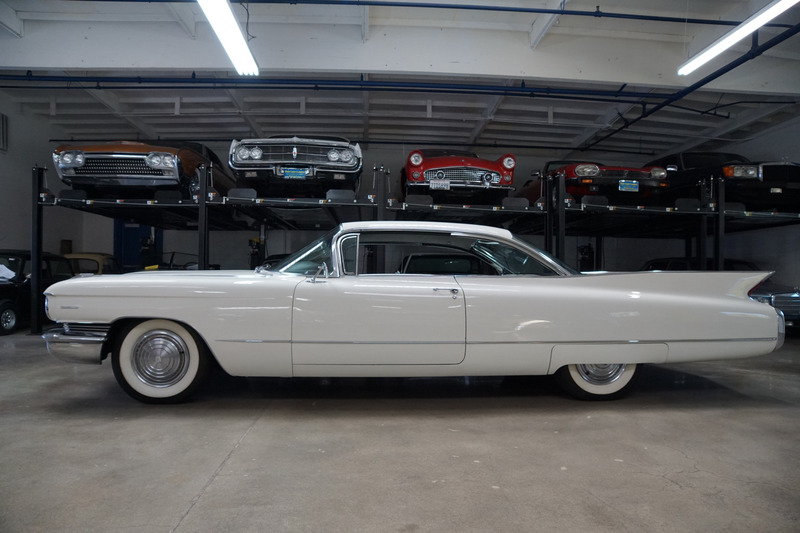 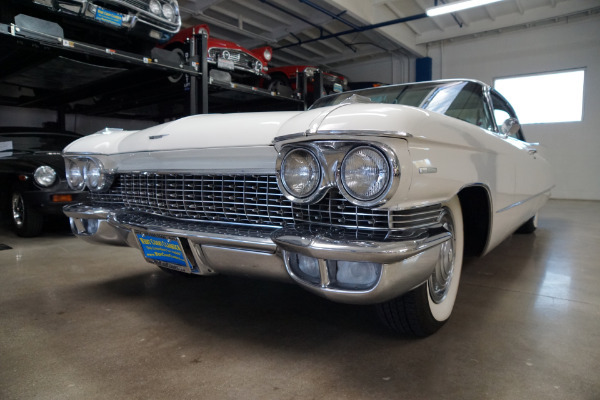 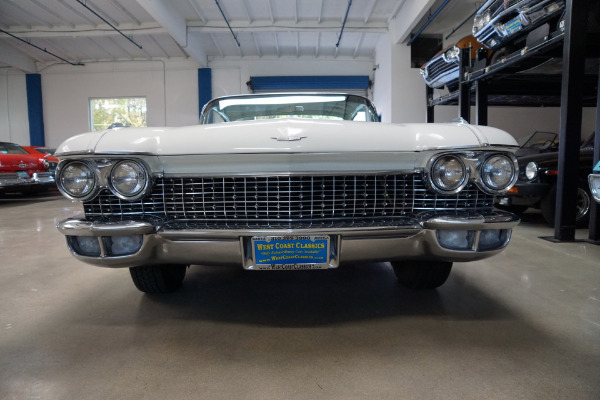 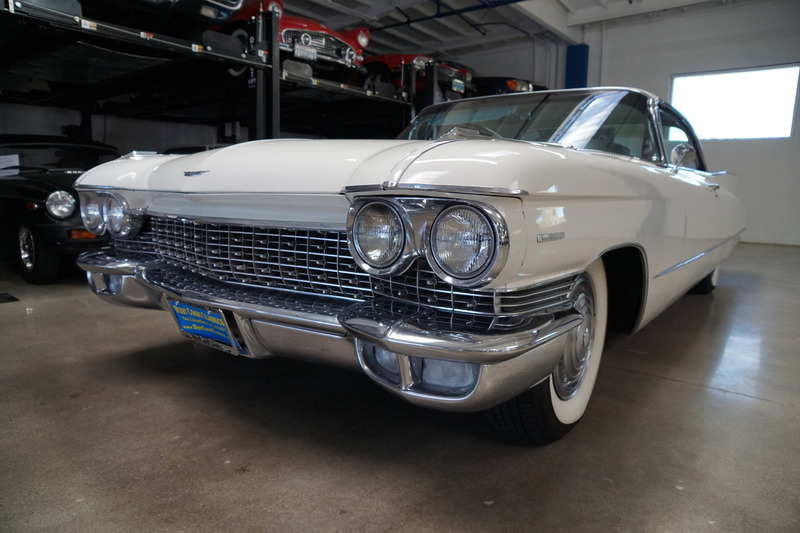 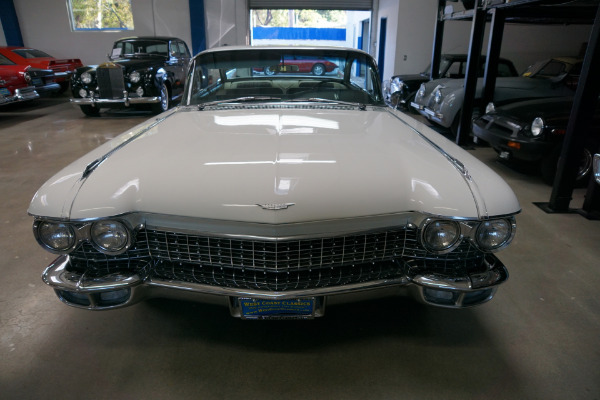 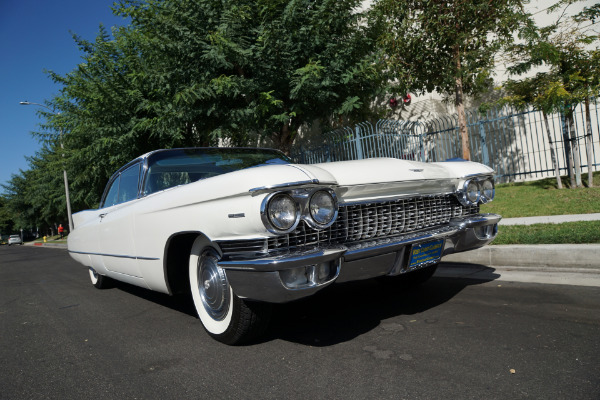 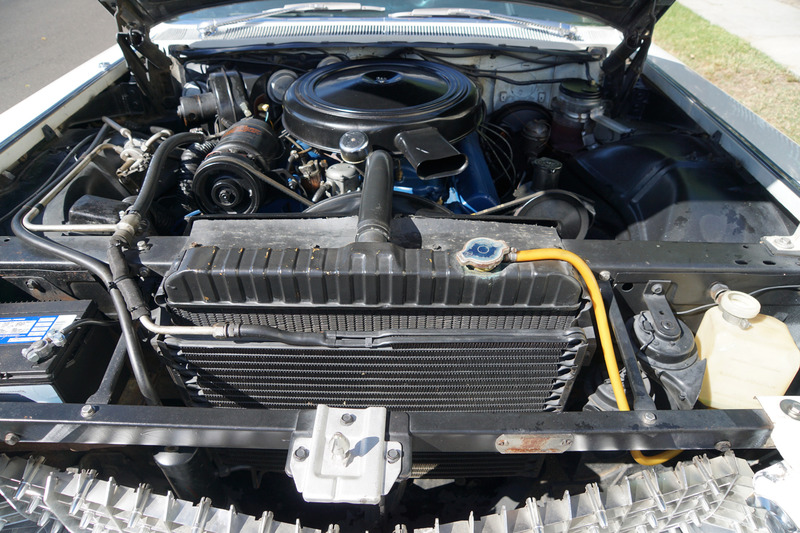 A perfect car for the Cadillac enthusiast for daily driving and a turn-key ready example of one very fine 1960's American classic car for any classic American classic car collector!